The Popocatepetl volcano near Mexico City has spewed a cloud of vapor with some ash about a mile (2 kilometers) into the air, but experts said it was not related to the quakes. The 17,797-foot (5,426-meter) volcano has been periodically erupting since 1994. Saturday’s emissions come shortly after three powerful quakes that together have killed more than 400 people. Officials say the death toll from this week’s magnitude 7.1 earthquake in central Mexico has climbed to 305. Civil Defense chief Luis Felipe Puente sent out a tweet on Saturday saying 167 of those deaths were in Mexico City. Morelos state accounted for 73, Puebla for 45, Mexico State for 13, Guerrero for six and Oaxaca for one. 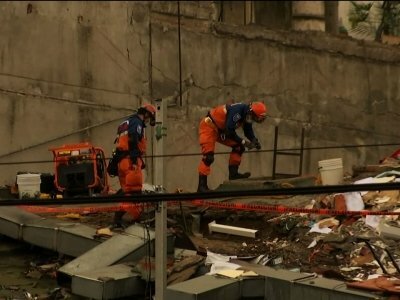 Rescue work is continuing four days after the quake struck. No place is treating more victims of this week’s deadly earthquake than Mexico City’s Xoco General Hospital. When the seismic alarm for a new quake sounded on Saturday morning, hospital workers ordered visitors to evacuate. That included 43-year-old Syntia Pereda, who was at the bedside of her sleeping boyfriend. Forty-nine-year-old Jesus Gonzalez fell from a third-story balcony of a building where he was working when Tuesday’s magnitude 7.1 quake hit, and he’s awaiting surgery. Pereda said she didn’t want to leave: “I was worried about him.” But she left the building and came back in when the shaking stopped. Seismologists say Saturday’s magnitude 6.1 earthquake in southern Mexico is believed to be an aftershock from a powerful Sept. 7 quake that measured 8.1 and killed at least 90 people. Mexico’s National Seismological Service says its own network has recorded thousands of aftershocks of the Sept. 7. It recorded 15 of magnitude 4.0 or greater just in the first in the first nine and a half hours of Saturday. Quake alarms sounded in Mexico City as a new quake struck, prompting people with fresh memories of this week’s devastating temblor to flee homes and hotels. Alejandra Castellanos was on the second floor of a hotel in a central neighborhood and ran down the stairs and outside with her husband. At the site of an office that collapsed Tuesday, street signs swayed and rescuers briefly evacuated from atop the pile of rubble before returning to work. Nataniel Hernandez lives in Tonala, one of the cities hardest hit by an earlier, Sept. 7 quake, which struck off the coast of southern Mexico with a magnitude of 8.1. The director of Mexico’s disaster agency says it’s an aftershock of the 8.1 quake that hit on Sept. 7 off the country’s southern coast. The new quake also swayed buildings in Mexico City, which is trying to recover from a magnitude 7.1 temblor that struck on Thursday, killing at least 295 people. It’s not immediately clear if the new quake caused damage or injury. The U.S. Geological Survey says the new earthquake to strike Mexico had a magnitude of 6.2 and was centered in the southern state of Oaxaca. That’s the region most shaken by a magnitude 8.1 quake that hit on Sept. 7. It also swayed buildings in Mexico City, which is trying to recover from a magnitude 7.1 temblor that struck on Thursday, killing at least 295 people. A strong aftershock has rolled through Mexico City, swaying buildings and sending some people running into the street. The quake was much weaker than the magnitude 7.1 earthquake that hit on Tuesday, killing at least 295 people and knocking down buildings across the capital. It was not immediately clear if there were any new injuries or damage from the latest quake. A magnitude 8.1 earthquake struck earlier this month near the state of Chiapas. In the stylish Condesa neighborhood, young revelers typically spill out from dimly lit bars and restaurants on a Friday night. But the first weekend since a 7.1 magnitude earthquake toppled buildings just blocks away began on a somber note. Instead of crowds gathered with beers, small handfuls of rescue workers still dressed in reflective vests took breaks from digging through rubble. Entire restaurants with white linen tables were empty. Metal gates shuttered others. “It feels lifeless,” said Mariana Aguilar, 27, a hostess at a bar and restaurant who stood waiting for guests yet to arrive. The upscale Mexico City neighborhood was one of the hardest hit by the quake that killed at least 295 people, with more than a half-dozen collapsed buildings in the immediate vicinity. The few Condesa residents who ventured out Friday night said they were anxious for relief from an anguishing week. As earthquake rescue operations stretched into Day 5, Mexico City residents throughout the city held out hope that dozens still missing might be found alive. More than half the dead —157 — perished in the capital, while another 73 died in the state of Morelos, 45 in Puebla, 13 in Mexico State, six in Guerrero and one in Oaxaca. Along a 60-foot stretch of a bike lane in Mexico City’s downtown, families huddled under tarps and donated blankets Friday, awaiting word of loved ones trapped in the four-story-high pile of rubble behind them. Along the bike lane, where families slept in tents, accepting food and coffee from strangers, people have organized to present a united front to authorities, who they pressed ceaselessly for information. They were told that water and food had been passed along to at least some of those trapped inside. Fernandez said officials told them they knew where people were trapped on the fourth floor.